I have been preparing this German-style cabbage recipe for years. The combination of vinegars helps the cabbage keep its bright color. Baking melds the flavors of the cabbage, onions and apples. Wonderful served with small crispy roasted potatoes. 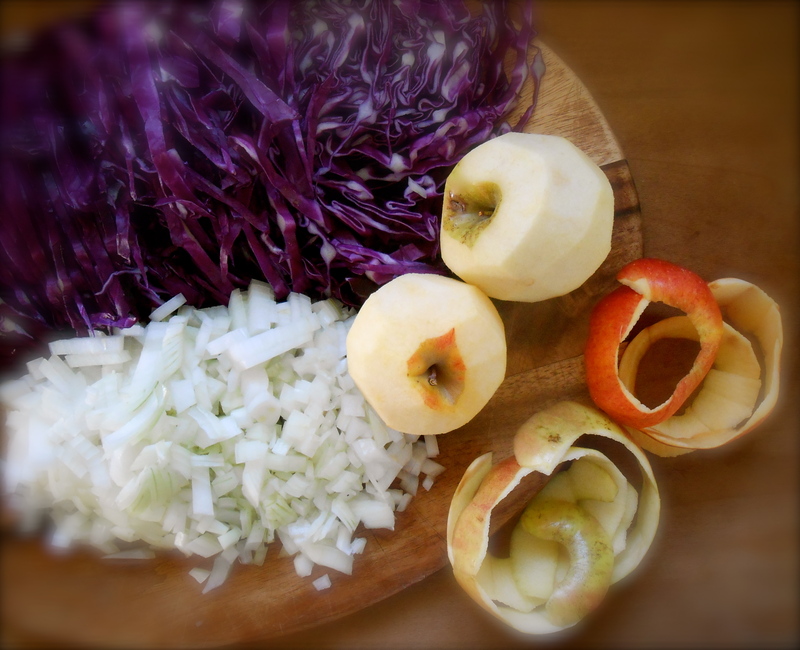 Red cabbage, yellow sweet onion, two sweet apples and a splash or two of vinegar…exquisite combination. Preheat oven to 350°F. In a large ovenproof skillet over medium high, heat the olive oil and sauté the cabbage and onion until cabbage has wilted and onions are soft, 15-20 minutes. Add the apples and sauté 5 minutes, add the vinegars and allow to evaporate. Cover and bake for 45 minutes stirring occasionally. Garnish with parsley and serve. This looks like a great dish for the fall. I like that you added apples. Very nice indeed. Simple and tasty. Thank you! You are right. Doesn’t get much easier than this. Love this dish. Oh yes, I can imagine how good it would be with potatoes. I love sweet and sour cabbage and your recipe sounds delicious. I’ve eaten many times but have never made it before. This sounds really easy to make. Great recipe. That’s beautiful. What do you usually eat it with? I never really cook with cabbage, but the color itself is very tempting and the addition of apples kind of softens the bitterness. Thank you Amanda. I always make crispy oven potatoes with this. Sometimes chicken, sometimes just…cabbage and potatoes. Yes, the apples are really nice in here. Gives the dish a very subtle sweetness. This is my favorite side dish with Christmas dinner, when serving prime rib. The only difference in mine is I use bacon. Yumm. Oooo….bacon! Sounds really good! Wish I was around your Christmas dinner table with the prime rib and all! Not to mention the good company too. Aaww just saw this…I hope some day you can be with family around the holiday season. This year we are making beef wellington, going to be fun!! This is one of our favourite sides..Growing up in a Canadian German family we only ever made the white sauerkraut. When I asked my Grandma about the red kind she didn’t know what I was talking about. I know this isn’t really ‘sauerkraut’ but I do buy this in jars quite frequently. A German friend of mine also makes hers quite sweet, sometimes she’ll put strawberry jam in! I think I’ll have to give this recipe a try. Yum Yum Yum. I make a similar recipe but add ginger & cinnamon. Oh how delicious! This sounds amazing! You have surprised me, as I wouldn’t have thought (not for a moment) that I would want to try something like this. Hah, I’m in the wrong. Bet this tastes great. Have you tried this with pork? Oh – this with a ham. And some roast potatoes. Perfect! Exactly my kind of recipe! Thanks!! :) thank you Jittery Cook! I’m a Summer person, to be sure, but something must be said for the dishes of Fall. The apples, pears, squash, and cabbage. The warm weather may be heading South but we sure are eating well. Your cabbage is a great example and sounds wonderful. yes, very fall! Great colors. Perfect. Nice twist using balsamic. Gorgeous colors! The apple cider vinegar and balsamic sound lovely. Your photos are lovely – they have a painterly still-life look to them. This is one of my favourite dishes. Being a Dutchie, I grew up with it (‘rode kool met appeltjes’). I love it cold too, in rye bread with pastrami. Yum! I’m intrigued that you bake yours. I do mine on the cooktop, which requires a bit of supervision. Oven-baking sounds like a great idea. Yes! My hubby’s family is from Germany and his “Omi” makes it stovetop…and cooks it for hours. I could never ever duplicate the goodness she brings out of the cabbage. I would be interested in hearing your take if you do try this. I have never asked Omi to…I mean, after all…she’s 92!! What a cozy fall recipe– the photos are great–so vivid– make it pretty irresistible! thanks. One of my favorite fall dishes…we have had it several times during our time in Germany and Austria. I made this for my in laws on the weekend with some roasted pork tenderloins…they loved it! Also, add a touch of cloves for a bit of spice in there…very nice! I do it with tart green apples and mustard. My 3 year old keeps on requesting more! 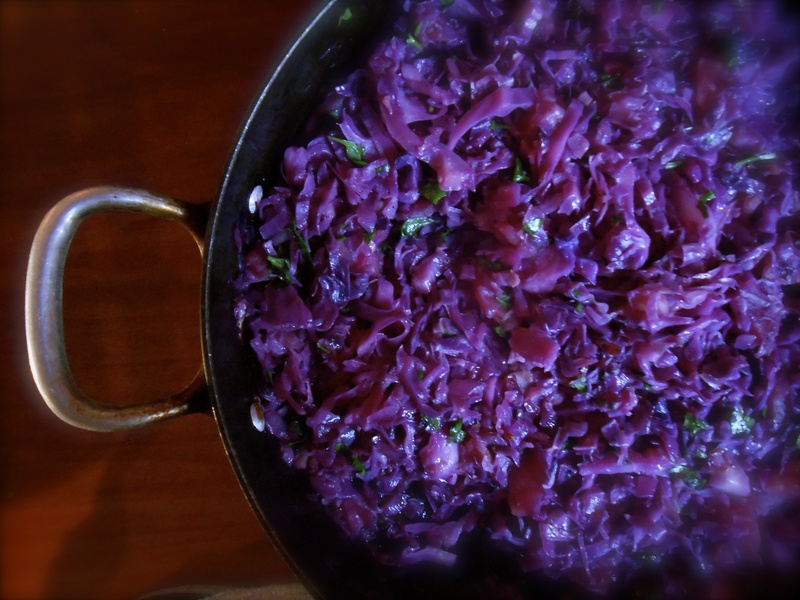 You are currently reading sweet and sour red cabbage at COTTAGE GROVE HOUSE.